Cuba's Gran Teatro de La Habana Alicia Alonso, one of the four theaters in use during the festival. Photo by Quinn Wharton. Anyone attending the National Ballet of Cuba's biennial Havana International Ballet Festival can expect an adventure that is equal parts treasure hunt and lottery, amidst a cornucopia of choices. This year's festival, the 26th, was no exception, offering 25 programs in four theaters. The event, held October 28-November 6, was also notable for the unanticipated absence of 96-year-old Alicia Alonso, the host company's founder and Cuba's ballerina assoluta. Due to flagging health, Alonso was unable to make her customary opening night appearance, where she would have been seated alongside Cuba's new President, Miguel Díaz-Canel. Sadaise Arencibía in Giselle. Photo by A. Sanguinetti, Courtesy Havana International Ballet Festival. National Ballet of Cuba's World Premiere of Cathy Marston's "Prospera"
Photo by A. Sanguinetti, Courtesy Havana International Ballet Festival. This time last year, Catherine Conley was already living a ballet dancer's dream. After an exchange between her home ballet school in Chicago and the Cuban National Ballet School in Havana, she'd been invited to train in Cuba full-time. It was the opportunity of a lifetime, and one that was nearly unheard of for an American dancer. Now, though, Conley has even more exciting news: She's a full-fledged member of the National Ballet of Cuba's corps de ballet. Hupoy (right, as Alla Snizova) and Laszlo Major in "Le Corsaire." Photo by Zoren Jelenic, Courtesy Ballets de Trockadero de Monte Carlo. One of the highlights of New York City's Fall for Dance Festival this year was an appearance by the Ballets Trockadéro de Monte Carlo, a company of men who dance on pointe with as much panache and style as any prima ballerina. Their performance of Paquita was funny, of course—they specialize in comic renditions of classical ballets— but also bracingly well executed. The star of the evening, Carlos Hopuy, aka Alla Snizova, was simply astonishing. His pointework sparkled, his hops on pointe were clean and strong, and he looked like he could have balanced in attitude forever. There was something deeply exciting about the way he combined delicacy and control with the explosive power and steel of a man's physique. Hopuy, who was born in Havana, Cuba, and trained at the country's famed National Ballet School, has been with the company since 2012. Like all the Trocks, he has both a female and a male alter-ego: when he's not portraying Alla Snizova, he's Innokenti Smoktumuchsky, a dopey cavalier. 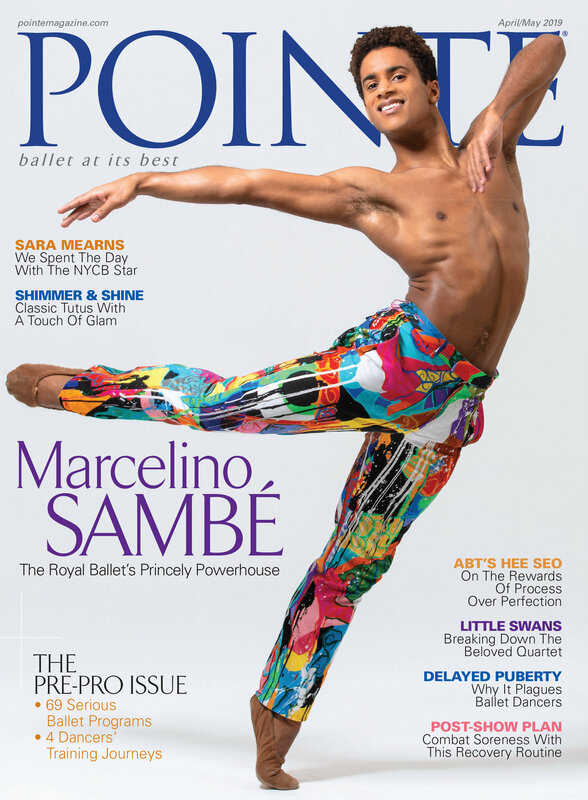 He is also one of the dancers featured in the upcoming documentary Rebels on Pointe, which will have its theatrical release November 15 (click here for theaters and dates near you). I recently caught up with Hopuy, who, when he's not on tour, lives in Orlando with his husband Paolo Cervellera, a former Trock. We spoke by phone, in Spanish. Did you always want to dance? I always liked ballet. My mother, Norma Hopuy, was a principal with the Ballet de Camagüey. I used to hang around the rehearsals. She started giving me lessons at home. Then, when I was nine, I auditioned for the National Ballet School. I had the choice between that and gymnastics and I chose ballet. When did you start going on pointe? When I was 11. I would ask my classmates for their old pointe shoes and would try them on at home. When my mother realized that I liked to go on pointe, she started training me and bought me my own pair. Catherine Conley. Photo by Alex Garcia. When I was 4 or 5, I told my mom, "I want to go to a real dance school with barres and a mirror." My preschool recommended Chicago's Ruth Page Center for the Arts. That's where I trained until I left for Cuba a year ago. I went to regular school during the day, and then had ballet class for four or more hours per day during the evenings and weekends. Nobody in my family has a dance background, but they've been supportive through all of it. My school in Chicago teaches a technique that draws on Vaganova, Cecchetti and Bournonville. I went to very different summer intensives, as well: American Ballet Theatre, the Royal Ballet School in London and Boston Ballet. Then, two summers ago, Ruth Page School of Dance director Victor Alexander, who is Cuban, arranged an exchange with the Cuban National Ballet School. A group of eight Cubans came to Ruth Page's summer intensive. I had to learn an entire pas de deux as well as a contemporary ballet piece in 10 days, and then perform them. I'd never had to do anything that quickly; it was hard work but exciting. I then realized that if I could dance professionally, I wanted to. Conley in class at the Cuban National Ballet School. Photo by Alex Garcia. Alicia Alonso in "Giselle." Photo by Frank Alvarez, Courtesy Dance Magazine Archives. Over the years, many companies have premiered works or made their U.S. debut at the Jacob's Pillow Dance Festival, and some of the world's most famous ballet dancers have performed there. This week I will give some more insights from the Pillow's extensive archives into the dancers that have graced this world famous festival's stage. Click on the links below to watch video footage of their performances. 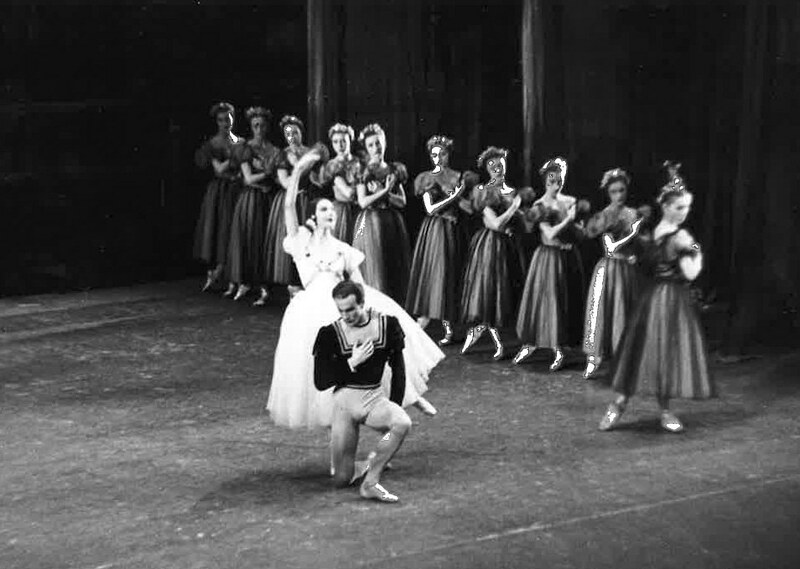 Alonso and Bruhn performing "Giselle" in 1955. Photo Courtesy Dance Magazine Archives. For American audiences, Balanchine's "Rubies" is instantly recognizable. Cuban audiences, though, have never seen the iconic work, due to over five decades of severed diplomatic relations with the U.S. That will change this Sunday, when Beckanne Sisk and fellow Ballet West principal Christopher Ruud perform the saucy, showy "Rubies" pas de deux at the International Ballet Festival of Havana gala. Pointe spoke with Sisk about making dance history. Sisk in Balanchine's "Rubies." Photo by Luke Isley, Courtesy Ballet West. You're no stranger to galas, but do they make you nervous? It's not a whole production, so I feel a lot of pressure to do well in those nine minutes. But it's also very exciting. I feel comfortable with "Rubies," and I'm so honored to be the first to dance it in Cuba. How do you think the audience will receive this pas? I feel like this is the perfect pas de deux to take because they love exciting dancing. This pas has a whole lot of everything in it! How does "Rubies" continue to challenge you? I'm learning to be able to throw myself and do all these crazy things while keeping the technique. I have to be poised and together in my core while throwing my limbs, so I'm finding that balance. There are no limits. It's all just power and go, go, go—there are no rest steps, and you do everything to the fullest. It's very showy, but it's all fun, feel-good steps. Besides performing, what else are you looking forward to doing in Cuba? I've never been to Cuba, so we're gonna try and do some touristy things. I'd like to see some cool cars, and the food—I can't wait to try the food! We'll also get to take company class [with the National Ballet of Cuba]. I'm really, really excited about that. What Do Changing U.S.-Cuba Relations Mean for Cuban Ballet? NBC principals Grettel Morejón and Alfredo Ibáñez perform at the opening weekend of the newly restored theater. “My dream was to dance in Cuba," says Lorena Feijóo. “I didn't want to leave my country." It's a lament the San Francisco Ballet principal shares with countless other members of the Cuban ballet diaspora: dancers who left their families, culture and country behind to escape economic hardship and seek artistic freedom abroad. The diaspora extends from Miami to Seattle to Oslo, where Cuban dancers' superb classical training and refined artistry are sought after. The problem is not a lack of appreciation at home—“The Cuban audience is absolutely insane about ballet," Feijóo says—but subsistence wages and artistic conservatism at the National Ballet of Cuba, and rigid restrictions on guesting overseas. In Cuba, dancers earn an estimated $30 to $50 per month. However, a balletic revolution may be on the horizon. What do changing U.S.–Cuba relations mean for Cuban ballet? Take a look inside the studios and theater of the world-renowned National Ballet of Cuba. All photos by Quinn Wharton for Pointe magazine. During the Cold War, Alicia Alonso was one of the first Western dancers to be invited to perform in the Soviet Union—where she danced Giselle, her signature role, in this 1958 clip. It’s not just her precise, sprightly footwork or her fluid, emotive arms that make her portrayal of Giselle so enchanting. Nor is it merely her acting, which successfully evokes a girl vacillating between reticence one moment and readiness the next in her lover’s company. Every ballerina must have these qualities, but Alonso has something more. Take the moment in Giselle’s variation after the hops on pointe. Even with talented dance actresses, the steps transitioning back upstage for the final pirouettes can seem like just that, a transition. Not so with Alonso. She leans off balance in a coupé, swings into a sauté and, in a joyous flurry, rushes to the corner. The heart she puts into the simplest steps goes beyond acting; Alonso shows us that this, indeed, is a girl whose passion is so great it could kill her. At 94 years old, Alonso still leads the National Ballet of Cuba, which she founded in 1948. By documenting the lives of two of her students, the 2015 film Horizontes (watch the trailer here) tells the story of Alonso’s legacy—which is still in the making. Her distinctly Cuban staging of Giselle for Ballet Silicon Valley opens tomorrow. Happy #TBT! Six dancers from the National Ballet of Cuba recently arrived in Miami after defecting while their company was on tour in Puerto Rico. The dancers have been taken under the wing of Pedro Pablo Peña, the director of Cuban Classical Ballet of Miami. 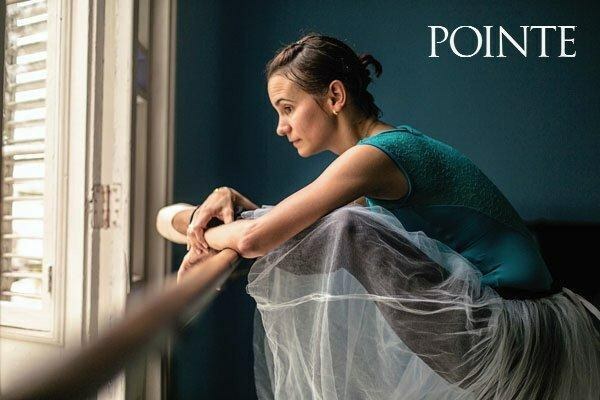 Peña is Cuban and has long supported defecting ballet dancers by featuring them in his company and helping them find work in the United States. Defection from the National Ballet of Cuba is nothing new. Dancers often leave the company when it goes on tour—the first defections took place as early as 1966, when the company performed in Europe. Though earlier defections were often motivated by political beliefs, Peña and the Cuban dancers claim that they are seeking artistic freedom and more encouraging job prospects. One of the dancers, Raisel Cruz, said that the position of young dancers in the company is "precarious and frustrating." Peña said that "all the young people do is dance. They are not too involved in politics. They want to develop their careers."